Fred Rogers was many things—a minister, a musician, a puppeteer, and a friend to generations of children. He was everyone’s very good neighbor. 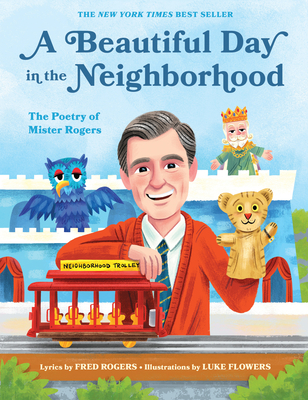 For over 30 years he created and hosted the groundbreaking educational television series Mister Rogers’ Neighborhood. He received the Presidential Medal of Freedom and was inducted into the Television Hall of Fame, among other distinguished honors. Luke Flowers has illustrated over 42 children’s books, including his author/illustrator debut series Moby Shinobi, a Scholastic Easy Reader that has sold 800,000+ copies across three books since 2016. Luke’s artwork explores a wide range of styles and techniques and has been featured in over 36 gallery shows in Los Angeles, New York, and Colorado. He also enjoys puppeteering, playing banjo, and going on adventures with his wife and three kids in Colorado Springs, Colorado. You can see more of his work at lukeflowerscreative.com.